Try The Pie's official debut has us swooning. "Moody" might be my most favorite sub-category of music. Not in the angsty teen way, but I've always been fond of music that evokes the illusion of being alone even if I’m surrounded by people IRL. Emphasis on being alone, not being lonely. There’s a line between blending in and becoming invisible. I find comfort in retreating from the outside world and inside my head for short periods of time. Try The Pie's Domestication conjures this specific feeling. 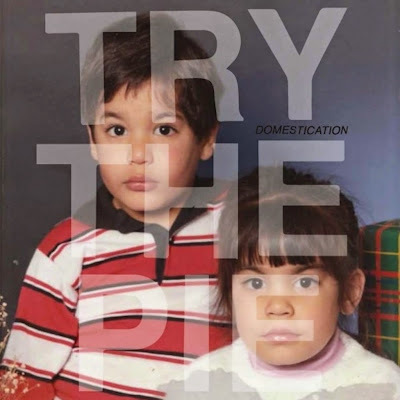 Try The Pie is the solo work of Bean Kaloni Tupou, a native of San Jose, California. Domestication serves as their first full-length record and it’s a conglomeration of their own personal narratives. When listening to Domestication, it’s not unusual to get swallowed by the wave of sound. Between the winding guitars, pattering drums and harmonious vocals, there are so many layers that build intimacy on each track that the context can be overlooked. IMO, that’s not a bad thing as long as you *~*~* feel *~*~* something though— truly, deeply, feel something. Isn’t that the whole point of music anyway? At the ripe age of 22, I’m supposed to be well beyond my hormonal teenage years, but that general some-type-of-way-feeling cannot be outgrown. For kids that were raised in the suburbs like me, the only noise we knew outside of our headphones was the chorus of lawn mowers in the distance and the tune of the local ice cream truck driving around your neighborhood. When I hear Try The Pie, it’s like I’m transported back to my bedroom at home, listening to indie rock music that had a special way of accurately capturing my raw emotions in that moment. It’s something I’ll never get back, but I’ll always be strangely nostalgic for because upon the first listen, I already felt understood. Listen to Try The Pie on bandcamp. Sydney Gore is a woman of many titles: Champagne Papi Pacify Princess, The Coolest Syd on The Block, and *~*~* professional Drake enthusiast *~*~* are some of them. Sydney is a native of South Jersey and freelance writes for a few of her favorite websites and magazines. She is still convinced that her life is a cancelled ‘90s sitcom— all the evidence can be found here.